While watching decorations on tanzaku sway in the wind, families walked along the first avenue in Okinawa City on July 6. 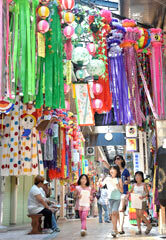 The star festival was held at the first avenue of the Chuo district in Okinawa City. The participants wrote wishes on　tanzaku, small pieces of paper, and hanged them on bamboo. Under colorful streamers, the event organizer provided fine white noodles served flowing in a small flume.